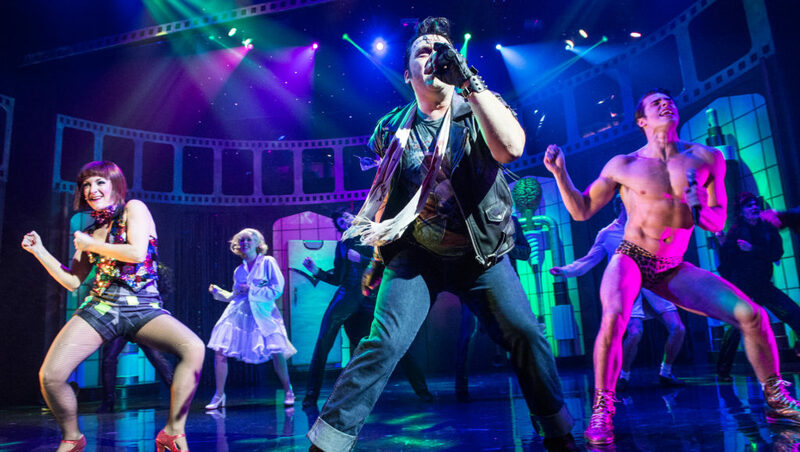 Since its debut in London in 1973, The Rocky Horror Show has been performed almost continuously across the world. The iconic 1975 film adaptation’s success and enduring appeal has sealed it firmly into the fabric of our modern pop culture. The Rocky Horror Show famously combines a ridiculous B-movie science fiction plot with comedy, horror and music. The story begins with the engagement of Brad and Janet (played by Ben Adams of A1 and former Strictly professional Joanna Clifton), a wholesome all-American couple, who on their way to share their exciting news with their former college professor, Dr. Scott (Ross Chisari), drive into a thunderstorm. Following a tyre blow-out, they approach a nearby castle for assistance. It is a night they will remember for a very, very long time. As their innocence is lost during one of the master’s affairs, Brad and Janet are introduced to an array of colourful characters. Clifton’s Janet is sweet, naïve and precious, which brings a gentle comedy to the character. Adams’ Brad is as ingenuous, but his desire to protect and control Janet only makes him more ridiculous. Kristian Lavercombe has been playing Riff Raff the creepy butler for many years, and has notched up over 1,400 performances worldwide. It is an iconic role, originally played by the show’s writer and creator, Richard O’Brien, and is a fan favourite. Lavercombe’s interpretation is near on perfection. He is as deliciously grubby and sleazy as you could wish for. I hope he continues in the role for evermore. Immoral and outrageous transvestite scientist, Frank n’ Furter has to steal the show. Stephen Webb, directed by Christopher Luscombe, is salacious and mischievous. At times, it feels as if there is too strong an emphasis on giving a depth to the character that is not entirely necessary. Dom Joly presides as Narrator, who is traditionally heckled by the audience in an outrageously rude fashion. He does an adequate job of rebuffing the relentless jibes, but seemed to lack the repertoire of retorts that others have previously brought to the role. Set designer, Hugh Durrant has created a background that is framed by an unfurling, giant reel of film. Frank n’Furter’s hallway gives us a gothic style that is reminiscent of a Hammer Horror movie. The lighting felt very fresh with dramatic use of green lasers during the laboratory scenes. The Rocky Horror show is always a riot. The audience is packed with regulars who know the script and are not ashamed to shout out or stand up and dance. There is little regard for their fellow audience members and some may find it all too much. But, this is all part of the phenomenon and the experience. Its enduring popularity shows no signs of waning and its near constant presence means that it continues to be enjoyed by new audiences as well. It remains, at its heart, simply a bit of fun – and it delivers that in abundance. In this classic dance musical comedy, we meet Broadway star Jerry Travers and follow him in his attempt to win the affections of socialite Dale Tremont. Ovation presents the London fringe premiere of a musical that has been delighting audiences since the release of the celebrated 1935 film version starring Fred Astaire and Ginger Rogers. Joshua Lay and Joanne Clifton are a fantastic pairing as Jerry and Dale. The chemistry between the two is undeniable and watching their love story unfold is a delight. The shoes of Fred Astaire and Ginger Rodgers were always going to be big ones to fill, but Clifton and Lay do them justice and embody the charm and sophistication of the era. From the principals to the ensemble, the rest of the cast’s performances are of a high standard. Much of the comedy comes from theatre producer Horace Hardwick (Darren Benedict), his valet, Bates (Samuel Haughton), and fashion designer Alberto Beddini (Matthew James Willis). Ellen Verenieks should also be mentioned for her confident portrayal of Horace’s wife, Madge. The limited space available is used very effectively, with Upstairs at the Gatehouse making use of traverse staging, as opposed to its usual thrust layout. Some of the action takes place on a raised platform at one end of the stage, which can be seen well from all angles and is a good addition. However, director John Plews does not overuse it and the rest of the stage is covered well, particularly during dance numbers. The production’s choreography is slick, particularly, and unsurprisingly, the tap dancing. Looking at the space available, you’d be forgiven for wondering how the dancers would be able to pull off big, show stopping numbers, but the staging actually works to their advantage. The audience is treated to an “up-close and personal” experience and can truly appreciate the details in the choreography that is, indeed, show stopping. 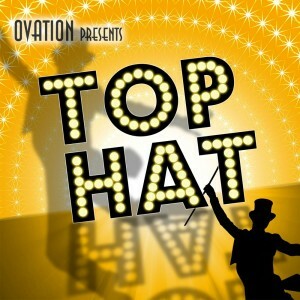 Top Hat is a timeless classic and any production following the film and successful West End run has a lot to live up to. This fringe production does not disappoint and is packed full of stunning choreography and classic songs such as “Let’s Face the Music and Dance” and “Puttin’ on the Ritz”. Charming from start to finish.